If your mother loves vintage glamour then I have the gift for her! 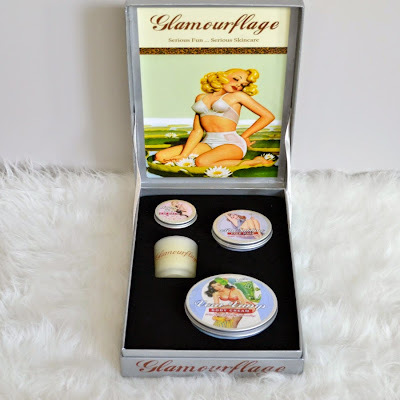 Glamourflage are a beauty brand that have created some beautiful products with amazing retro packaging. Their tag line is "Serious Fun ... Serious Skincare" which really does sum them up perfectly. I was sent the gift box "Spoil Yourself" and I can't get over the packaging. It's divine. The products are in tins, so it gives off a very vintage feel. Like theBalm, their products have personalities (eg theBalm has Cindy-Lou Manizer, Glamourflage has Foxy Fay). A face mask for me is really spoiling myself!! With a 2 month old and a 4 year old, getting 10 or so minutes to myself (that's uninterrupted) is bliss... just like this mask. Ideally you would use the mask for 15-20 minutes once or twice a week, but 5-10 minutes for me works a treat too. It's a clay based mask with aloe vera, witch hazel, macadamia nut oil, coconut oil, shea butter and vitamin E.
The scent is gorgeous and reminds me slightly of walking into a florist and being hit with a fresh floral smell. There's 120ml in the tin and it's roughly twice the size of a Lush face mask container. Just like the mask, this body cream has a gorgeous scent. The texture of the cream feels like a dream. It sinks quickly and easily into my skin and leaves it feeling so incredibly soft. It contains macadamia nut oil, coconut oil, aloe vera and vitamin E to keep your skin moisturised. This version does have natural mica particles which gives your skin a sheen with a small glitter like effect. For me this would be a night out moisturiser, not any everyday one. If I was to wear this, Scarlett my 2 month old would end up with it all over her! They also have the "Vera Vamp Body Cream-Moisture" which doesn't contain the mica. I want to pick it up as I love the cream. This has a gorgeous raspberry scent, which you notice straight away when you open the tin. It's pale pink in the tin, but goes on clear. What I like about this lip balm is the fact that it's light but I can build it up by applying 2-3 layers on without it feeling heavy or goopy. They have 5 other flavours in the lip balm range (I want to get my hands on chocolate, tangerine and honey peach) so there's something for everyone. It also came with a votive candle. It's a citrus candle and the lemon really jumps out to me. In the box, there's over $78 worth of product (excluding the candle) and this box retails for $59.95 so it's great value. After being able to try these products I have a few more on my wishlist and some suggestions for your mum. The Awesome Eva Eye Mask would be a must for any new mum as you put it over your eyes to shut out light so it's perfect for daytime naps. The Satin Sally Sleep Mask is perfect for a too busy mum as all you do it apply it to a clean face before bed time then wash it off in the morning. Any of their soaps would be amazing for a mum like me who's only time to herself is in the shower ... (and even then my little ones like to interrupt). My picks would be the Gardenia or Lychee scent. And finally the Raunchy Rosie Hand Cream would be perfect for any mum who does way too many dishes! Glamourflage is available online here as well as being available at David Jones online and instore. Have you picked up your Mother's day gift yet? Or have you been dropping hints? I love the packaging! I had that mask, but sadly, it wasn't amazing.